Holocaust survivor Charles Rotmil speaks to teenagers in Augusta about living in Nazi Germany as a Jewish child. The official end of the Holocaust was May, 1945. 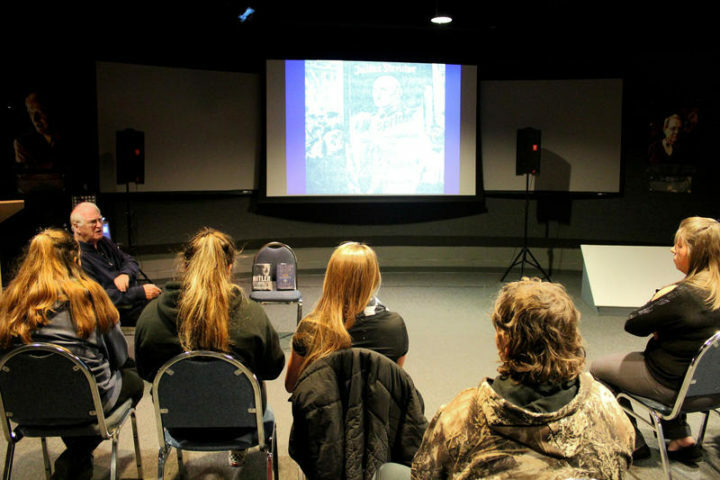 In the 73 years since, many of the survivors of the genocide have passed away, but some are still here and telling their stories, including some survivors in Maine, who are seeking a younger audience to keep theses stories from being forgotten. 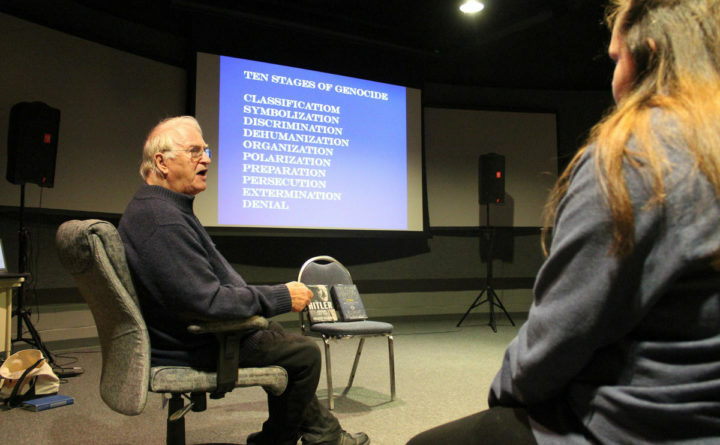 On a recent weekday morning, Charles Rotmil sits down in front of a large, blue projector screen at the Holocaust and Human Rights Center in Augusta. He begins to recite a story he has told to thousands of students across Maine. “I was born in Strasbourg, which is on the border of France and Germany,” Rotmil begins. On this day, he’s speaking to just a handful of students. He shows them an image of a young girl being executed by Nazi officials. “This girl is 16 years old. How old are you? How old are you?” he asks the students. “Can you imagine?” he asks. Rotmil tells them that he’s a “witness,” a “hidden child.” A Jewish boy who grew up in Hitler’s Germany during the time of the Holocaust and who lost his mother, sister and father. As millions of Jews were taken from their homes and sent to concentration camps, Rotmil and his brother went into hiding. They found shelter with a Catholic monk, and later with a Catholic family. But Rotmil says he still came face-to-face with death on multiple occasions: Nazi soldiers, he says, would ransack the homes of people they suspected were harboring Jews. A group of young students hear about the Holocaust from survivor Charles Rotmil at the Holocaust and Human Right Center in Augusta. On the large projection screen, Rotmil displays newspaper headlines and the kind of hateful messages he’d see every day. Yet it was a newspaper ad — in a German-language Jewish publication in the United States — that ultimately brought Rotmil to America. Rotmil’s aunt and uncle saw his name in a list of survivors published in the months following the end of World War II. 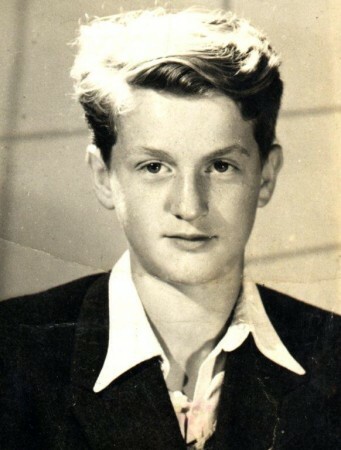 In 1946, at the age of 14, Rotmil emigrated to the United States. But for decades, he says, he still hid his story and identity. Afraid it could make him a target, even in a new country. About 30 years ago, with the encouragement of the former director of Maine’s Holocaust and Human Rights Center, Rotmil says he decided to tell his story publicly. It was nerve-wracking, he says, to share long-hidden details. But he soon saw the impact, as students would come up to him from the audience and share their own stories of trauma. David Greenham is the associate director of the Holocaust and Human Rights Center, which later this week will bring together Rotmil and others with first-hand stories for an event looking back on the 80th anniversary of “Kristallnacht.” That was the night in 1938 when troops across Germany destroyed stores, buildings and synagogues and arrested thousands of Jewish residents. Edith Pagelson, another Holocaust survivor who will also take part in the event, says she sees some of that hateful rhetoric manifesting itself currently, across the country and Western world. Pagelson says she was devastated when she heard the news late last month that 11 people were killed in a shooting at Pittsburgh’s Tree of Life synagogue. The attack comes as anti-Semitic hate crimes are already on the rise. Yet Pagelson is also encouraged by the response to the shooting, bringing together thousands of people in vigils nationwide, representing many different faiths. Charles Rotmil was encouraged by the response, too. But he also says it’s important to keep telling his story so lessons aren’t forgotten, years down the road. Rotmil will tell his story again Friday, Nov. 9, 2018, at the Holocaust and Human Rights Center in Augusta. Education reporting on Maine Public Radio is supported by a grant from the Nellie Mae Education Foundation.